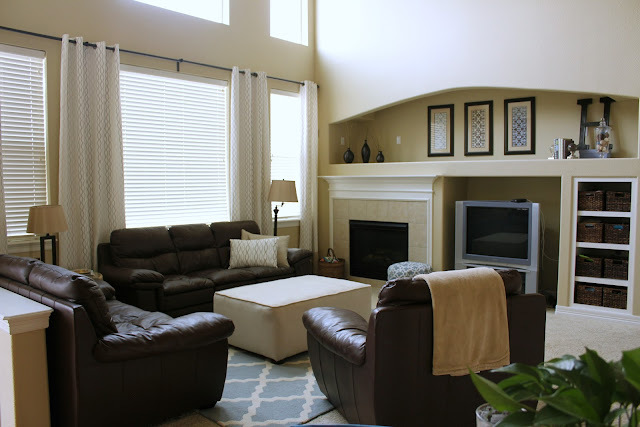 When we moved into this house I knew I wanted to hang curtains from the tall windows. I started shopping around and priced fabric. While I could have sewn the panels, fabric by the yard adds up quickly when you are talking about hanging curtains from 10 feet up to the floor times 8 panels. (I hung 4 in my kitchen and 4 in the family room). On a shopping trip to Ikea I came across the Henny Rand curtains and instantly liked them (which is rare for me.) More like myself, I walked away thinking I would find something else I liked better. Well weeks went by and I kept thinking about the curtains...I know, who thinks about curtains? Well, this lady does! Now I had to figure out how to make them work. Ikea tends to carry curtains longer than most store brands (96 inches) but my tallest window was over 10 ft tall. I would need at least two more feet on the tallest curtains in the family room and the kitchen panels would also need some added length. 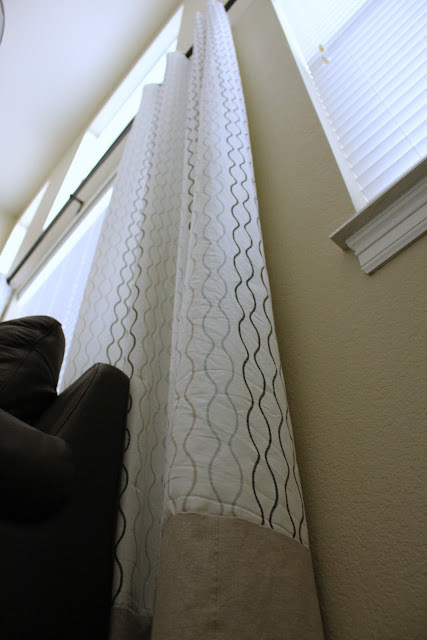 So when I headed back to Ikea to purchase the curtains, I also picked up the Lenda curtains to add to the bottom of each curtain panel and rods, mounting hardware, and finials while I was at it. This may seem like a lot, but considering I spent $50 dollars alone on one window curtain rod in my last house, I felt that 43.32 for all the rods and hardware was pretty good. This covered two large kitchen windows plus my large wall of windows (18 ft across). **Side note- on the wall of windows, the curtain rod is actually two rods, resting together on the center piece of mounting hardware to make it look like one continuous rod. ** Add the $24 I spent for spray paint and I still think it was well worth it. The rods come in a cream or silver color, so if that works well in your house, you can spend less than I did. I also originally tried to use other finials (I don't love the Ikea ones) and those were $15 a pair...but in true Ikea form, only Ikea finials fit into their rods :) And had I purchased fabric to make this I would have spent way more...even with coupons and cheaper fabric. Here is how I made the curtains long enough. First I measured to see how much length needed to be added. I cut out that length, plus a few inches extra for hemming by the width of the curtain. Once again, as Ikea never disappoints in these things...the curtains were not the same width...just a tad off. Enough to have to correct it, ugh! So, I also ripped out the side seams once I had the length cut. I pressed it flat and laid it on top of my main panel, right sides together. I matched up the side seams and refolded the seam to fit. I quickly stitched the side seam, pressed, then laid it back on top of the main panel and pinned it together. I then stitched it on using a narrow seam allowance since I was not finishing off the back of the curtain with anything that would hide the seam. Once I stitched it on, I left the curtains un-hemmed. I wanted to make sure they were long enough so I pinned them while they were hanging just to be extra careful. Once I had the length marked, I took them down, pressed up the hem and stitched. And that was it...not much work for extra long curtains! Great job on making things work the way you want them to. It can be very satisfying.